This morning I made a new waffle recipe. It was whole wheat and super healthy, and I’ve been looking forward to trying it out. It was AWFUL. They were so incredibly bland that I had to choke down a few bites before I decided all the rest of the waffles and batter were going in the garbage. It was that bad. After making up a batch of waffles, my heart was completely set on a warm and delicious waffle breakfast. I almost wanted to start all over and make one of my favorite waffle recipes that I could trust, but the breakfast moment was over. My hubby was on his way out the door, and my 2-year old was already filling up on his tastless poor-excuse-for-a-waffle. So I got out the old bowl and spoon, and frosted mini-wheats have never tasted so unsatisfying in my life. Blend wheat berries and milk on high for 4-5 minutes, until batter is smooth. Add remaining ingredients and blend on low for a minute, or until incorporated. Cook on hot waffle iron. (Stir batter before pouring into waffle iron, because the heavier wheat particles will settle at the bottom.) Makes about 10 waffles. And now, time for the best part of a waffle breakfast – the homemade SYRUP! This is the best syrup ever. In the whole world. It can’t be beat. :) Seriously, when I offer to make waffles or pancakes for breakfast, the first thing my husband says is, “With Coconut Syrup?” If I say, “Well, I ran out of coconut extract…” or “I don’t have buttermilk” then he passes on the waffles. No joke. This syrup is a MUST around here. (And if you don’t like coconut, there’s a good chance you will still like this. It’s got the subtle sweet coconut flavor without the coconut texture.) Anyway, it is truly DELICIOUS. Place butter, buttermilk and sugar in a pot. Then turn stove on medium and stir until butter melts and sugar dissolves. Bring to a boil and boil one minute. Remove from heat and add soda and flavoring. It will bubble up; just continue to stir and give it a few minutes for the ‘fizz’ to reduce before serving. I have started learning how to sprout wheat and make sprouted flour. I’m trying to make healthy breakfasts and foods for the family, I’ve been sprouting soft white wheat. Why do you like hard wheat? Whats the difference and when would you use soft? I love your web site as well and use it often to get good recipes. Thanks. These look amazing. I am having a link party this week featuring breakfast foods made from food storage. I think this recipe is a great fit. If you would like to link up that would be great. We had these over the holidays… AMAZING!!!! Thanks for sharing! Great syrup, although I half the amount of butter and my husband and I like it better that way – more coconut flavor, less butter flavor. Hi Anonymous, "T" means Tablespoons. I'll change the recipe so it says Tb so it's easier to understand; but for your future reference, if you see a capital T that means Tablespoons and a lowercase t means teaspoons. I hope you like the syrup! Yum yum! hi, im just wondering if someone can tell me what 7-8 T is…is that teaspoons, tablespoons or tons???? ?…i want to make the coconut syrop and very illiterate when it comes to measurements…thanx…. How much coconut syrup does this recipe make. I was thinking about making half of the recipe. Also how long is the shelf life for this syrup. Do I keep it in the shelf or do I refrigerate it. This coconut syrup is a favorite at our house. It really is heavenly!! I just bought 45 lbs of wheat and wanted to find some recipes to use it. The waffles are great! I’m trying some of your other recipes this week! Keep cooking and posting! 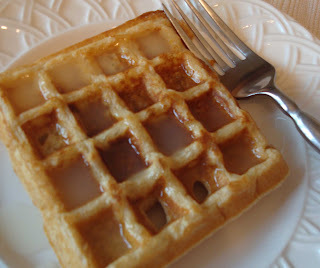 Mmm… I love these waffles and the coconut syrup is to die for! Griff and I love it! I discovered your site a few months ago and LOVE it! It’s getting me excited about cooking again. I made the waffles and coconut syrup last weekend and we all loved them. Your Cinnabon cake, Cowboy Cookies, Salmon Cakes, and Thai Chicken Peanut Noodles were all delicious, as well. I can’t wait to try more recipes! Erin, you are so funny! :) I LOVE the coconut syrup too…and I can’t wait to try the waffles! They sound delicious. Perfect for me too since I have wheat but no wheat grinder yet- haha!! i found your blog through mykitchencafe and just wanted to tell you what yummy recipes you have. i loved the honey lime enchiladas. i threw the chicken and maridnade into the crockpot and let it cook for a few hours, they were great! i just made your waffles last night and they were also yummy. i have a very similiar recipe for syrup but mine is with vanilla not coconut. i tried yours last night and now i’m not sure which one i like beter! Erin, I make this ALL THE TIME!!! It’s my #1 bribe for Brianna to stay in her bed all night. I just promise her I’ll make her some of these in the morning!!! I’ll love these forever. Thank you!!! Mmmm–I am excited to try these! I make blender pancakes all the time with wheat berries–but I have never made waffles. I am sorry your waffles this morning were icky! Have a good day! !